Armand de Beque, an early Mesa County resident and interviewee of the Mesa County Oral History Project, had his fair share of dirt on his father, Dr. Wallace A.E. de Beque. 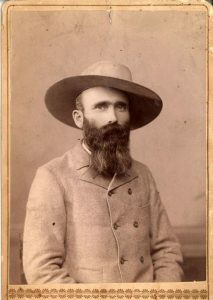 Dr. de Beque was one of the founders of De Beque, Colorado, a small town in Mesa County. As described in an interview with Armand, Dr. de Beque came to the Mesa County area in the late 1800’s. Dr. de Beque arrived after a young adulthood spent fighting in the Civil War then going to the University of Pennsylvania to become a surgeon. After his school years, Dr. de Beque moved to Mesa County and pursued jobs working as a cattle rancher and then a surgeon in De Beque for railroad workers. Armand remembers this story running in the Denver Post in the 1950’s, as it caused quite the hubbub in the community. Dr. Wallace de Beque lived through this sticky situation to tell his tale and many others, which you can access on the Mesa County Oral History Project. We have a great history to be told.